Parents often question the wisdom of going on safari with children. Will they grow impatient of game drives, is the not inconsiderable cost wasted on them? Yet, it is hard to think of a holiday more suitable for families. Read on for our advice if you are considering a family safari and our tips on what to look out for in choosing a family safari. 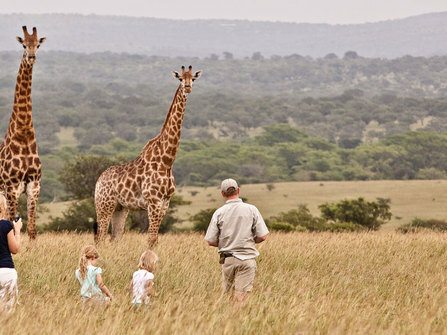 Safaris are by their nature, incredibly family friendly. Not family friendly in that it is all about the children, this isn’t one of those experiences where parents sit on marvelling at their children as they enjoy themselves, family safaris are about staring in wonder together, parents and children equally enraptured by the experience. For children, a safari is arguably the best classroom in the world, bringing nature to life with impassioned knowledgeable guides and hands-on exhibits. This is about sharing an adventure together. #1 Be Adventurous: Mix game drives with walks, horse riding or cultural activities. We find children can usually handle 2 days of this easily. For very active children or for longer stays, we recommend staying somewhere where there is the option to mix the game drives up with walks, horse rides and children’s activities such as poo tracking (always popular). #2 Be Adventurous: Don’t be afraid to camp, whether it is in luxury or simple fly camps, camping in the outdoors gives a better connection with the wilderness and wildlife than being cosseted in a large lodge. #3 If possible, get a private vehicle, if not then sharing a vehicle with other families is preferable. Whilst it is usually fine to be mixed in, the last thing you want is to be on a vehicle with a photography fanatic who insists on long stops which test your children’s patience. #4 Don’t cut costs on the wildlife experience. By all means look to cheaper accommodation options, but don’t be tempted to cut costs on the guides or vehicles. It is no fun sat in a minivan in the Masai Mara whilst your guide spends all his time on the VHF trying to find out from the other guides where the animals are. #5 Safaris work well with time on the beach. We usually find the structured itineraries of a safari are complimented perfectly by a couple of days free to relax by the beach at the end of your holiday, where everybody can let their hair down. e.g. Combining the Masai Mara and Kenyan Coast. #6 Differences in camp pricing policies for children add up. Some camps charge as little as 25% of the adult rate for a child under 12, whilst others charge 75% and upwards, it pays to know which camps offer the best children’s discounts. With family groups of four or more, private camping expeditions, private luxury safari houses and some higher end camps can become a lot more affordable on a per person basis. #7 Consider sleeping arrangements in the camps. Camps often accommodate children in separate tents to their parents. Whilst this is perfectly safe, many parents of younger children will feel more comfortable sleeping with the children near them. Some camps have larger family tents capable of sleeping up to four. For larger family groups private safari houses (fully staffed private rental houses within the parks) can make a lot of sense. #8 Don’t choose a lodge based on the children’s activities alone. Many lodges and camps make a big deal of their children’s activities, but look carefully. Often these are glorified baby-sitting services so mum and dad can go on game drives on their own. In reality, all that is needed to bring a safari experience to life for children is good guides, used to dealing with children. It isn’t about the programs in place it is simply about the attitude of the staff. #9 It isnt’ all about the big 5: Focus on the small as well as the big, it is no fun racing around a reserve trying to spot lions. Tell your guide that you are interested in the small creatures and the plants as well as the big ones, tell them you want to learn about the edible plants, about how to identify animal tracks. #10 Make sure children go to the toilet before the game drive. Often, it just isn’t possible to get off the vehicle for a loo break. #11 Binoculars are essential. Have at least one pair to share amongst the family, all the better if your children can have their own pair. #12 Bring wildlife guide-books with you, children (and many adults) love ticking the wildlife checklist off as they spot them.